This Pulitzer Prize-winning classic tells the poignant tale of a Chinese farmer and his family in old agrarian China. The humble Wang Lung glories in the soil he works, nurturing the land as it nurtures him and his family. Nearby, the nobles of the House of Hwang consider themselves above the land and its workers; but they will soon meet their own downfall. The working people riot, breaking into the homes of the rich and forcing them to flee. When Wang Lung shows mercy to one noble and is rewarded, he begins to rise in the world, even as the House of Hwang falls. Was it good?--- it's not too bad. Was it bad?--- it's not that good. 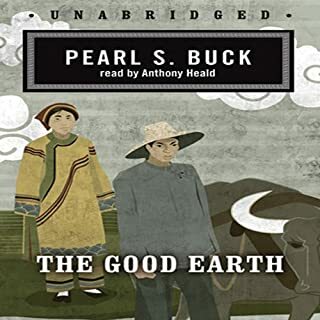 The Good Earth is a story about a man, a farmer, and his family. Ok, look... take your grandfathers life, perhaps add a few higher highs or perhaps sprinkle in a few lower lows, and then dip the whole thing in rural turn-of-century chinese culture. There's your story. It just was not that exciting. Nor was it that emotional or that inspirational. Basically something good happens to the farmer, then something bad happens.... then he gets lucky, then he has bad luck.... and it goes on and on. The entire story seems to be constantly building up to something that never really occurs. You never get to know any of the characters in depth, not even the main character. Your just told the things that happen to them. The writing is clunky... it has the feel of a shorter story into which odd bits and pieces were wedged to create a novel. It lacks the flow of emotion that may have made this book a beautiful tale about a normal life filled with struggle and success... instead it just comes across poorly maintained dairy which sometimes includes emotion and sometimes just chronicles events. The narration was disappointing. It might be a little thing, but I felt that a true asian accent would have added greatly to the experience. Overall this is a 'safe' listen. You'll be able to listen to it without getting upset or too bored.... but if someone asks you how that book is your listening too, I'm afraid you'll just answer "its not that bad, but it's not that good either." Know what your in for, and then enjoy the ride! 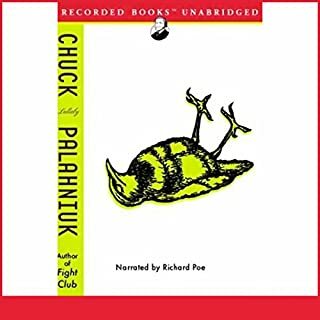 Lullaby is a book about a man who discovers that a particular children's poem has the ability to kill those who hear it, and his quest to rid the world of this cursed chant..... Now, if you think this is actually going to be a story about a man, a deadly poem, and some adventures, then you do NOT know Chuck Palahniuk. Lullaby is a wild ride that deviates violently from any coherent story line. Often nothing makes sense and nothing is meant to. It is an adrenaline pumped chaotic journey that happens to include an original story along the way. So be warned... this is not your Dickens or Ken Follet here. If your expecting that, then your going to be shocked. Chuck Palahniuk's writing is crazy and intense. It's an experience all it's own. I highly recommend this book for pure excitement and originality. Plus the narration fits the story perfectly. Les Misérables emphasizes the three major predicaments of the 19th century, each symbolized by a major character: Jean Valjean represents the degradation of man in the proletariat, Fantine represents the subjection of women through hunger, and Cosette represents the atrophy of the child by darkness. At the risk of offending generations of proud French readers, I have to say that I did not enjoy Les Miserable. 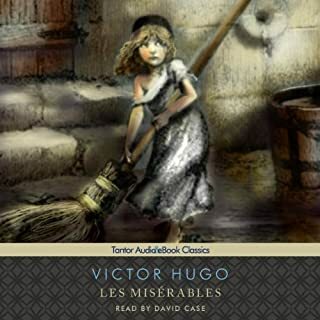 I have been an avid Dickens reader/listener for years, and while I did not expect Hugo to be quite as good as Dickens, I was excited for at least something comparable. Les Miserable is not comparable. I found it drab, predictable, and not well developed (surprising considering the length). The interactions between characters and the way their paths cross is often so ridiculously coincidental that it at times it just seems silly. Even in the Abridged version, the story line crawls along at an unbearably slow pace. I am sorry to all those hugo fans out there, but as a lover of 19th century European writers I can say that I do not understand how Les Miserable has emerged as a 'classic'. I admit that something could be drastically lacking in this 12 hour Abridged version that is better presented in the full version, but if that is the case, then I still could not recommend this abridged version. One way or the other, it was very disappointing. On the bright side, David Case does a a great job narrating this book. The best way to describe this audio book is good fun. 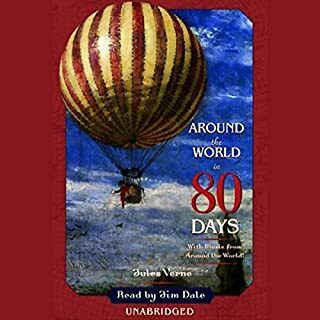 Some of Verne's books have trouble keeping the modern day reader excited or even interested, but Around the World still accomplishes it. It's light, easy, adventurous, and comical. This recording is particularly good because of the amazing talents of Jim Dale. He is absolutely the best out there. 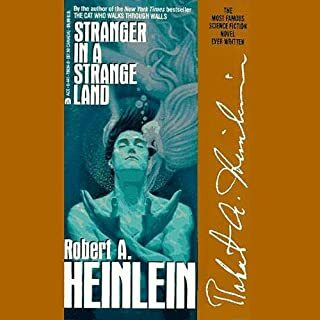 Stranger in a Strange land is a scientific classic that has been popular for generations.... and I have no idea why. The story set up is interesting enough: a human raised on mars is brought to earth, where he and his new 'family' deal with his great powers and unique innocence, and along the way we should all learn something about humanity and ourselves. The problem is that the author does a poor job of interweaving his social commentary and ideas into the story itself. Clever story telling and character development are replaced by long and boring "lectures" on a given subject between two or more individuals. There is some good and witty commentary, but it mostly the same subjects revisited over and over and over as two characters have a long conversation by the pool, and later on the phone, and later over dinner, and so on. You want to give the author the "we get it, move on!" signal. I think I would have been more entertained with an actual 16 hour lecture on sexuality, religion, and corruption of innocence. The narration was not great. Numerous times it felt like he forgot which character he was voicing and mixed them up. This was hard to notice because he did not deviate character voices much at all, but it was still perceptible. The sound quality was poor. Unfortunately, I cannot recommend this book as educational, introspective, or entertaining. Feel the texture of Fitzgerald's language as master reader Alexander Scourby, with cool precision, unfolds the mystery of Jay Gatsby. A true classic of American literature, The Great Gatsby celebrates a "heightened sensibility to the promises of life," an American capacity for hope that remains unsullied even by the falsity of what it pursues. Fitzgerald's clean, elegant style evokes to perfection the glitter and charm of the Jazz Age, as well as the falseness of its values. This is a GREAT book.... truly one of the greatest novels ever. But you knew that already, everyone knows that. The Great Gatsby does not need me to praise it. Now for the 'but' part.... I think that this book is better experienced as a 'read' rather than a 'listen'. The perfection of this book is in the details, the small things, the writing itself... and these things may not be fully appreciated in an audio production. Just listening to this book may leave you saying 'sure, it's a really good book, but why is it considered one of the greatest??'. In this case, the audio is good but it is no substitute for a reading. That being said, this is a very good audio production. The sound quality seems a little dated, but the NARRATION IS SUPERB! Alexander Scourby does an amazing performance here. 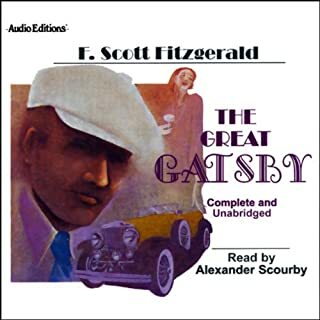 So do yourself a favor, enjoy this audio production, but if you have never actually read The Great Gatsby, pick it up. I think you'll better appreciate the genius behind this work if you do. Inch by inch, day by day, Scott Carey is getting smaller. Once an unremarkable husband and father, Scott finds himself shrinking with no end in sight. His wife and family turn into unreachable giants, the family cat becomes a predatory menace, and Scott must struggle to survive in a world that seems to be growing ever larger and more perilous, until he faces the ultimate limits of fear and existence. To slowly and actually shrink. From 6 ft, to 3 ft, to 1 ft, then to an inch, less than an inch. How would you get food? How would you get water? How would you feel? 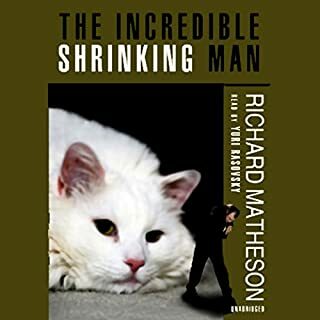 This is what Richard Matheson does so well.... create incredible circumstances, put real people in them, and describe the reality of how they feel and survive. If your expecting something cute like Honey I Shrunk the Kids, then move on. This book dwells deep into the emotional drain on the main character who is actually shrinking. It explores his fear, desperation, anger, and loneliness (don't worry, there's also plenty of adventure and excitement). I loved this book, and highly recommend it for a fun and at times emotional read. The narration was also very well done. I bought this audio book on a whim and could not be happier that I did. What a great story and amazing audio production. The book itself is just about perfect.... so creative and fun to read. The characters are developed just perfectly enough to keep the reader involved, but not 'weighted down'. And the characters intertwine so well. Neil Gaimen has simply created an amazing story. But what really makes this audiobook one of the best I've ever listened to is the narration. Lenny Henry does a near perfect job here. He adds so much to an already great story. I just wish he'd narrate more! 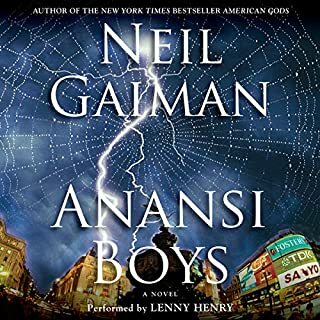 I cannot recommend this book enough for a fun, funny, completely captivating and utterly entertaining audiobook. Best friends Will Halloway and Jim Nightshade know there's something odd in the late October air. It all begins when a lightning-rod salesman appears one evening and insists that they take one of his contraptions covered with mystical protection symbols. Later, the boys look on as an eerie carnival rolls into town. Mysterious and sinister events take place, and what they witness on the carousel is enough to send them running. Ray Bradbury is a master of science-fiction and a great writer, but this is not my favorite book of his. The story is very creative, but honestly it's just not very thrilling. I didn't find myself "on the edge of my seat" as I was hoping. Most of all, it's just too wordy. Normally Bradbury is a beautiful writer, mixing words and emotions brilliantly. But in this one he rambles on with long and often painfully bad descriptions or metaphors. The narration was fine, but did not add to the book... and it did need adding too, or at least intensified somehow. It's not a boring story, and has it's moments. But for someone looking for a thrill or scare or intense excitement then I'm afraid this might let you down. The system was simple. Everyone understood it. Books were for burning, along with the houses in which they were hidden. Guy Montag was a fireman whose job it was to start fires, and he enjoyed his job. He had been a fireman for 10 years, and never questioned the pleasure of the midnight runs, nor the joy of watching pages consumed by flames. He never questioned anything, until he met a 17-year-old girl who told him of a past when people were not afraid, and a professor who told him of a future in which people could think. Guy Montag suddenly realized what he had to do. Fahrenheit 451 is a truly amazing book. 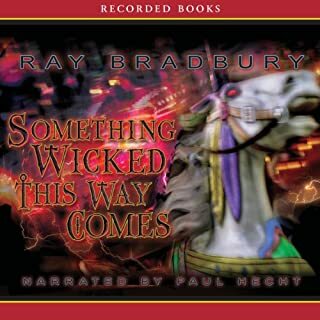 Ray Bradbury is widely regarded as one of the great science fiction writers of the 20th century, but he is often overlooked as simply on of the best writers. His prose is beautiful and emotionally deep... and F451 is him at his best. The underlying subject of the book might seem simplistic enough... censorship of ideas is bad. But I think a good example of the true genius of Bradbury's writing is F451's antagonist's explanation of why books should be burned. 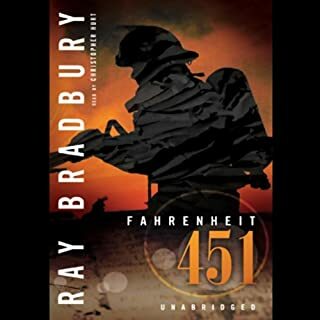 Bradbury doesn't take the easy way out here, but actually formulates a real and almost believable explanation of the history behind the Firemen's job (burning books). It's amazing. The entire book is amazing! It really caught me off guard with how much better it was than I expected. The narration was also done very well. The readers deep voice really adds to the over tone and suspense of the book. His presentation of female voices leaves a little to be desired, but it does not take away from anything. Overall the audio production was very well done.